I've been compiling this list on Patreon, with the idea being to collate group of more modern, printed works beyond the superhero genre that's hopefully accessible to anyone interested in comics, irrespective of foreknowledge. It's not exhaustive by any means -for example, the whole landscape of self-published mini-comics and webcomics where so much recent and excellent work is done isn't represented- but I hope it's still useful. I'm continuing to add to the list with daily entries on Patreon, and once there's enough titles to make-up a part 2, I'll publish that here, also. Age of Reptiles by Ricardo Delgado: One of the ultimate tests of an artists is how well they can draw a dinosaur, and Ricardo Delgado is someone you'd trust to draw dinosaurs for your life (should such a situation ever arise). Age of Reptiles is a wordless, prehistoric comic following various groups of dinosaurs back when people were a still a twinkle in the eye of evolution. It may sound straightforward, and it is: stolen eggs,hunting strategies, craftily laid traps, brutality of loss, systems of power and reliance, territory battles -and no dino story is complete without raptors being conniving little shits- are all woven into Delgado's compelling drama. It's so impressive, you almost forget how difficult it actually is to create something of this scale, to convey it on the page with a degree of belivability. Delgado is a superior draughtsman; the detail his fine lines conjure, coupled with a stunning use of colour all work to makes Age of Reptiles a uniquely special work. Mazeworld by Arthur Ranson and Alan Grant: The first man to be hanged after British parliament's reinstatement of the death penalty, Adam Cadman finds it's not death, but a strange world with beasts and warriors waiting for him at the end of the hangman's noose. As he tries to ascertain whether he's alive, dead, or somewhere in between, the residents of Mazeworld are convinced he's the 'hooded man' spoken of in their prophecies. 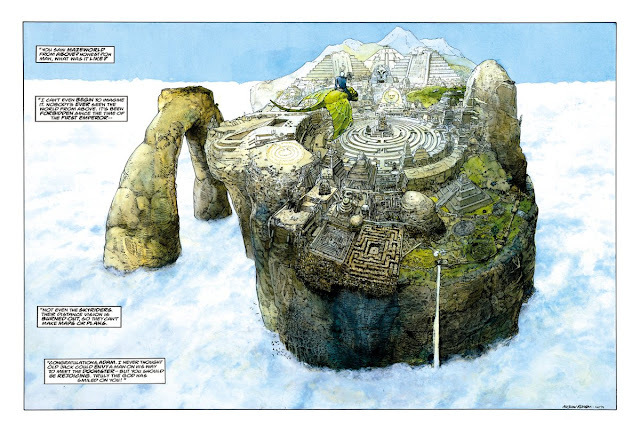 From detail to tone, overlooked comics-master Arthur Ranson's art does all the work in convincingly bringing Mazeworld to life, his realistic style grounding fantastical elements, and giving body to darker aspects of the story. Surreal imaginings, covert organisations, one man up against everything and yet not sure quite what: at its best 'Mazeworld' compares to the bizarre menace of 'The Prisoner' -and that's one of the highest compliments I can give. 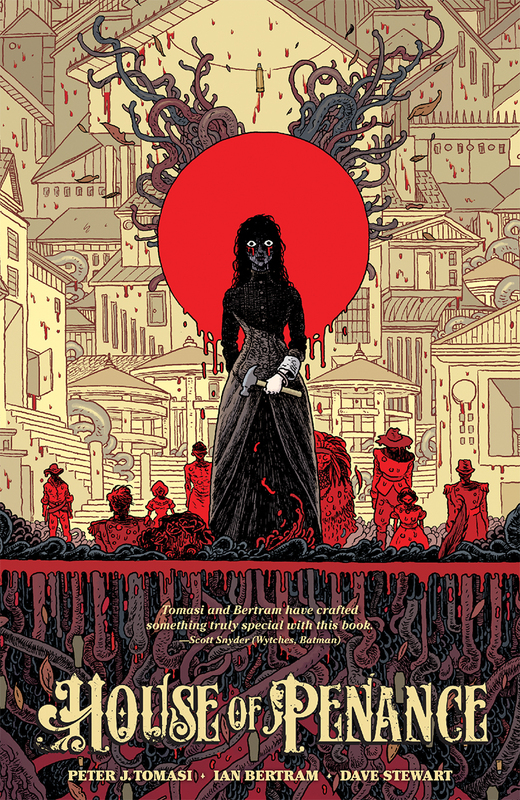 Beautiful Darkness by Kerascoet and Fabien Vehlmann: Gory, insidious, discomforting: 'Beautiful Darkness' follows a group of tiny Borrower-esqe people as they attempt to survive in the woods with winter drawing in. Near by, the dead body of a young human girl lies decomposing... This small band of people and their community provide 'Beautiful Darkness' a lens through which to examine social constructs and roles, the effect of their upholding and disintegration, and the dangers of idealism. An astonishing, unblinking work, it's beautifully painted by Kerascoët, whose superficially appealing style blindsides the reader into confronting the juxtapositions between image and reality, nature and conformity. A modern classic. 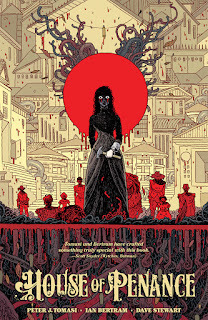 Birth of a Nation by Kyle Baker, Aaron McGruder, and Reginald Hudlin: Taking the events of the 2000 US election as a springboard, 'Birth of a Nation' imagines the largely African-American population of a disenfranchised and disrespected East St. Louis seceding to declare itself the sovereign Republic of Blackland. Hope and ideals prove a tricky thing to shape into workable tangibility, with the journey to independence littered with compromise, interference from outside and within, an impatient constituency, and people out for themselves. Kyle Baker's cartooning carries both depth and irreverence, delivering pathos and absurdity in full measure. A hilarious, biting political satire, the intricacies of which remain pithily relevant today. 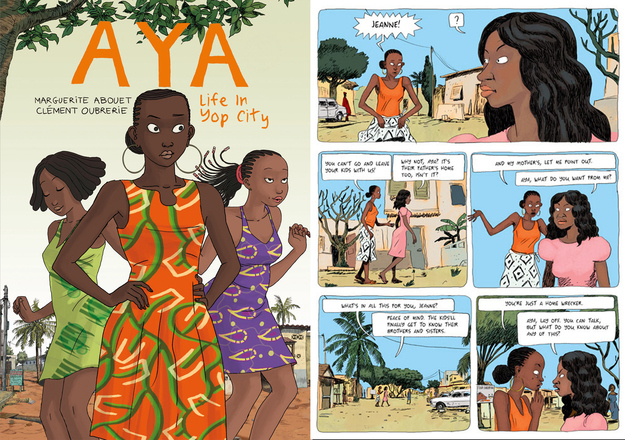 Aya by Marguerite Abouet and Clement Oubrerie: Collected in 2 pleasingly hefty volumes, 'Aya: Life in Yop City,' and 'Aya: 'Love in Yop City,' Marguerite Abouet's bildungsroman of a young woman's life in 1970's Ivory Coast is delightful; rich in detail, warm in tone, and lovely to look at. Clemet Oubrerie's expressive art deftly brings to life both a range of strong personalities and the at turns bustling, at turns laconic nature of the Ivory Coast itself. What's most satisfying about Aya is the real and natural progression of characters as they grow to face more adult concerns. It's rare to see such a truly encompassing, fleshed-out work in comics, where each part of a character's life, their relationships, hopes and dreams, are thoroughly addressed. Through the Woods by Emily Carroll: One of the first names that pops into mind when discussing contemporary horror comics, perhaps nobody is as effective in slowly conjuring up dread as Emily Carroll. Her eerily atmospheric tales combine the transcendent and sub-conscious with elements of folk and fairytale, all the while remaining grounded in the sinew of human impulse and emotion. Curiously attuned to people's fears, Carroll open use of page layout allows her to slide into the questioning, murky areas of the reader's brain to simmer and suggest. 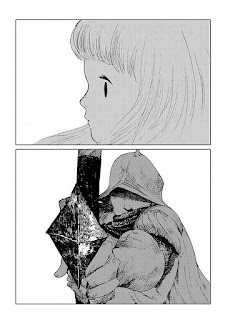 But it's her ability to weave strong narratives with uniquely evocative images to create genuinely unsettling, creepy comics, that easily put her at the forefront of the genre. 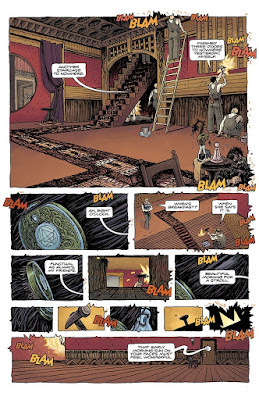 Aama by Frederik Peeters: Largely unheralded upon translation, Frederik Peeters' Aama is nevertheless an unequivocal modern sci-fi great, not least because it features a cigar-smoking chimp-android named Churchill. Peeters delves into the idea of humanity's future lying in an evolutionary amalgamation of the natural and technological worlds, as 2 estranged brothers are thrust together to track down an AWOL sentient bio-robotic science experiment. Peeters' gorgeous artwork rises lushly to the task of realising vivid imagined concepts to the page: lurid jungles of flora; sharp, metallic-cluster space vehicles; fractured mindscapes, and gloriously weird creatures. Ordinary Victories by Manu Larcenet: The sole Manu Larcenet work to be published in English, 'Ordinary Victories' is a magnificent diptych following the life of photographer, Marco, which, on the surface, follows a recognisable narrative path: man stagnating with career and relationships attempts to break out of rut. Yet Larcenet is too good a writer to not offer something better; more nuanced. He shows the knots and flaws of Marco's character as exactly such, displaying the ways in which they both impact his life as well as those around him- and unlike many male-crisis portrayals Marco faces his shortcomings, undergoing emotional growth. 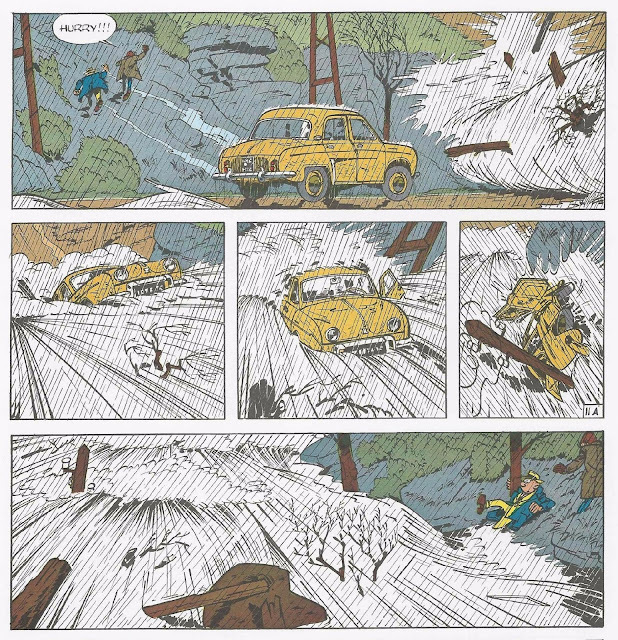 Larcenet's cartooning is marked by an open empathy, as Marco navigates anxiety attacks and the loss of his father whilst coming to terms with having a child of his own. As banal, complex, and moving as life itself. 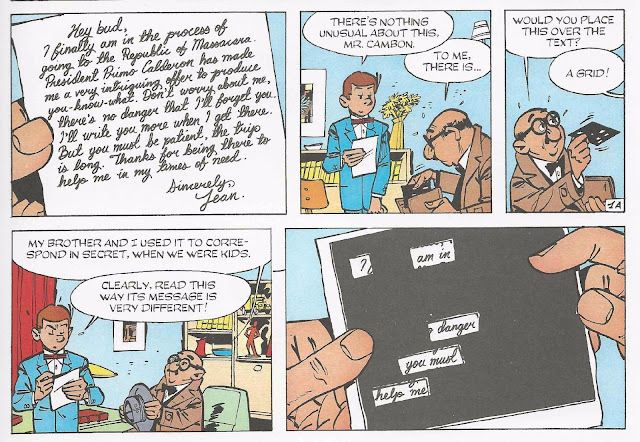 Cul de Sac by Richard Thompson: Serialised in The Washington Post in the noughties, Richard Thompson's Cul De Sac is arguably the last great newspaper strip, and unarguably a wonderful, towering achievement. What makes the brief sojourns into the life of Alice and her family and friends exceptionally singular is the sheer room Thompson is able to lend to an array of ongoing narrative elements. Thompson is impressively effective in quickly imbuing traits and tones he wants conveyed. From Petey's shoe-box dioramas to Mr Otterloop's car, Dill's brothers to Alice's manhole dancing, the uh-oh baby to Tommy Fretwork and his banjo, each is sewn seamlessly into the tapestry of the strip, made significant no matter how brief the appearance. Fine, spidery lines combined with sketchily hatched textures further provide the cartooning with a quirky, expressive charm. Every aspect of Cul de Sac is immensely appreciable in its own standing. An objectively superlative work. Safari Honeymoon by Jesse Jacobs: Jacobs' tale of a newlywed couple eager to take in the sights and experiences of their first class safari holiday weaves man's separation, distrust, and exerted dominance over nature with slyly absurd humour and invasive body horror. The brash, misplaced confidence of the humans clashes with the unaware, seemingly naive jungle beings. Drawn with mitochondrial intricacy, Jacobs' style is exceptionally suited to Safari Honeymoon's thematic leanings: appropriately lush with dizzying detailed sequences, and yet with a quality of inscrutability that belies intent. Sock Monkey Treasury by Tony Millionaire: There's no need for subversion when the fertile fields of children's literature provide a rich tradition for the strange and off-kilter. It's this tradition that Tony Millionaire deliberately -and so effectively- taps into with Sock Monkey, a beautifully stylised compendium of stories following the adventures of the titular cloth primate, a stuffed, manic crow, and Inches, a porcelain doll. From being captivated by a rainbow-light-reflecting glass doorknob, to experiencing guilt and self-loathing over the accidental killing of a baby bird, to brutal, epic character journeys, Sock Monkey finds its complex, not always likeable cast display their sentience in a myriad of very human ways. Weird, brilliant, and always engrossing. Literary Life by Posy Simmonds: Undoubtedly one of Britain's finest cartoonists, Posy Simmonds has authored a number of favourites for young and old, from 'Mrs Weber's Diary' to 'Baker Cat,' to 'Tamara Drewe' and 'Fred.' Yet perhaps nowhere do her qualities of observational touch and sharp wit combine to better effect than in 'Literary Life.' Serialised as a Saturday strip in the Guardian's Review section, she deftly dissects the pretensions of the literary world, taking on the egos of male authors, reading group politics, booksellers' burdens, children's literature, and more. 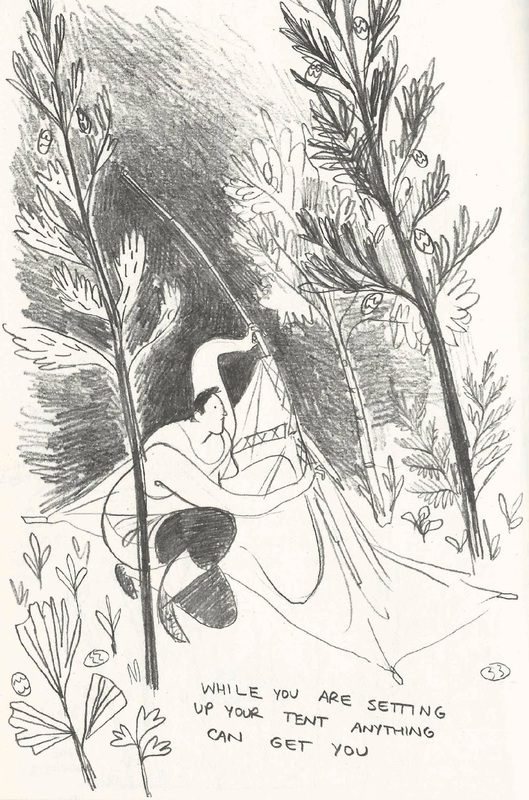 Simmonds' cartooning is always a joy to behold; her lines carry such humour and affability, working in stylishly appealing tandem with her more scathing satire. Helter Skelter by Kyoko Okazaki: You'll be hard-pressed to find a more cutting critique of the intense social regimenting of women's appearances than Okazaki's tale of a super-model prepared to go to the most extreme lengths to preserve her success. Sharp, angular lines acutely parallel themes of beauty and pain. Courtney Crumrin by Ted Naifeh: What makes Courtney Crumrin stand out amongst the magical teen genre is the successful, layered portrayal of its protagonist. Dragged to a new suburb and a new school by her indifferent parents, Courtney's prickly personality is informed by their neglect, and the ostracisation of her peers, resulting in an impatient, defensive, temperament that anchors and drives Ted Naifeh's 7-volume series. 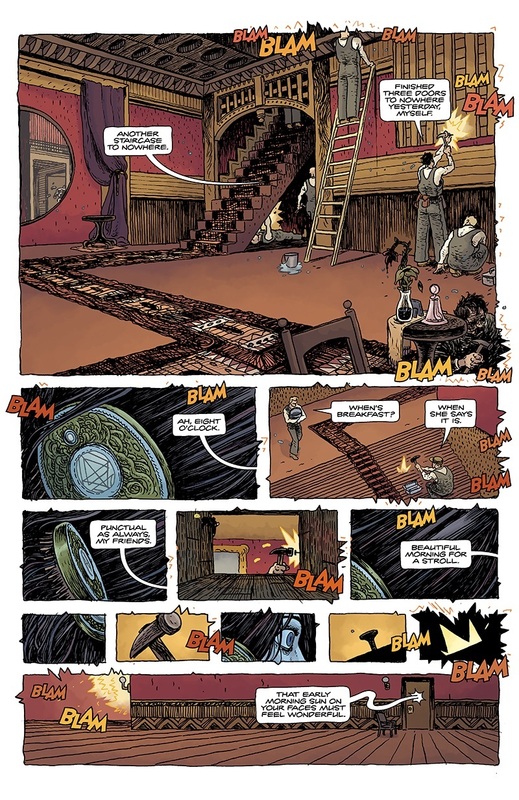 Naifeh's supernatural, spooky shenanigans are given an extra depth by virtue of being firmly informed by the depiction and journey of its central character; as Courtney discovers there may be a sliver of a silver lining to moving homes in the form of her mysterious Great Uncle Aloysius and the Crumrin legacy. The Absence by Martin Stiff: One of the most memorable British comics in recent times, Martin Stiff's story of a man who returns to his small coastal village in England after the second world war is an exercise in building suspense. Presumed dead, Marwood Clay is the lone solider from his town to make the trip home, now horribly disfigured and strangely hated and shunned by all. But Marwood's pariah-hood extends beyond a resentful discomfort of his survival, to events that took place before he left and changes that have occurred since. Taut and intriguing, Stiff maintains a grip on the attention throughout, the starkness of his black and white art creating a implacable atmosphere that gives little away. Three Shadows by Cyril Pedrosa: A true gem of a book, 'Three Shadows' is a hugely emotive tale; a windswept treatise on loss and fate sublimely rendered by Pedrosa. Three ominous shadows appear suddenly on the horizon outside Louis and Lise's woodland house, drawing closer each day. As Louis and Lise's anxiety increases in proximity to the foreboding visitors, it becomes clear the shadows are here to take their young son- and that nothing will stand in their way. But an angry, scared Louis will not let his son go without a fight, leaving behind Lise to embark on an epic journey to save him. Pedrosa's loose, sweeping art defines this beautiful work; soft charcoals and deep inks acutely expressing each heartfelt beat. We3 by Frank Quitely and Grant Morrison: Part of a government experiment, Cat, Dog, and Rabbit are house pets who have been augmented with cyborg-esqe shells and weaponary. But they are just the program's prototypes, and with testing complete, the semi-sentient animals are now marked for permanent decommissioning. Desperate to live free, they seize an opportunity to escape, to preserve their family and search for "home" away from the clutches of the shadowy agency that created them. Quitely goes to town on the spectacular visuals depicting an evocative maelstrom of violence, panic, and pain in this gut-wrenching tale. Yotsuba &! by Kiyohiko Azuma: Funny, warm, and off-beat, Yotsuaba & ! follows the everyday adventures of a 5-year old, green-haired girl who lives with her single father. The cast of the comic is bolstered mainly by the three daughters of the family next door with whom she spends a lot of time, and also by Yotsuba's dad's friends: the very tall and aptly-nicknamed Jumbo, and Yostuba's mortal enemy, the younger Yanda. 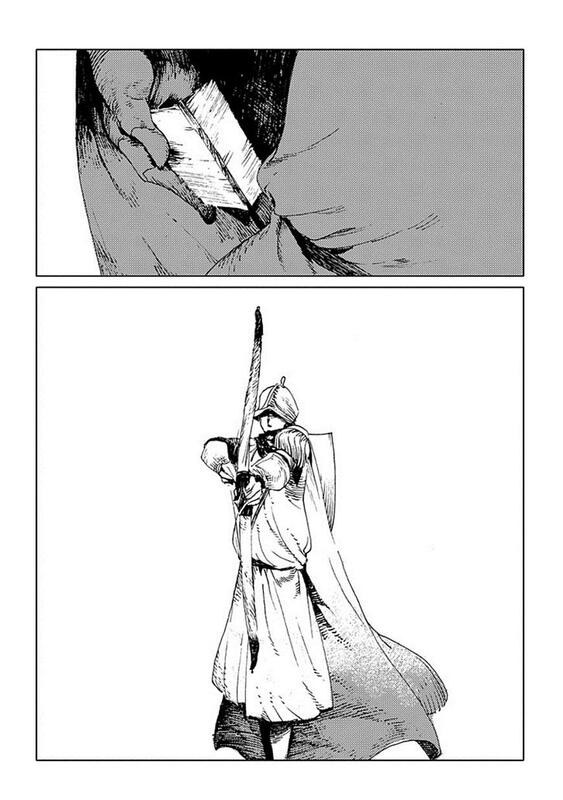 There are many 'slice-of-life' mangas, Azuma's Yotsuba as truly special. 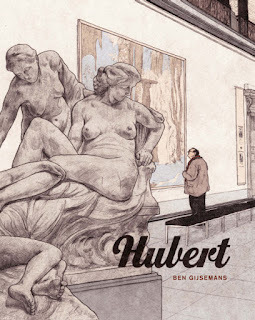 It's one of those very few comics where the tone, pitch, characters, pacing, writing, and cartooning all coalesce into a reading experience that's so completely fluid and natural that it's unassailable. To make the mundane interesting is a tough task; to make it immersive and joyful, yet still believable is masterful. 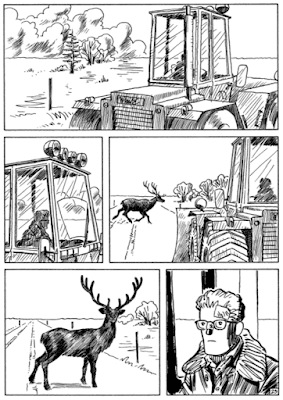 The Walking Man by Jiro Taniguchi: Adhering to the Ronseal ethos of 'does what it says on the tin,' The Walking Man does indeed feature a man walking. The reader joins Taniguchi's nameless protagonist as he takes respite in journeying around his town on foot. In following the man, we're forced to match him for pace, to stop when he does, to take in what he sees, the way he sees it; to appreciate things such as a jar of flowers left on the pavement, ducks gathered in a pond, getting caught in a sudden soft snowfall, impulsively buying a balloon from the market and blowing it up right there. There are few who exemplify contained elegance better, and Taniguchi's clear, precise style details the minutiae of environment thoroughly. Beautifully, quietly affirming. 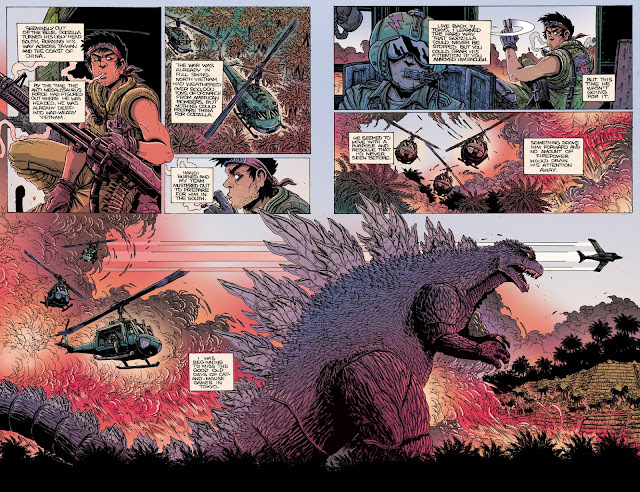 Godzilla: the half century war by James Stokoe: You don't have to know anything about the God of Monsters to know the unadulterated excellence of James Stokoe's standalone miniseries. 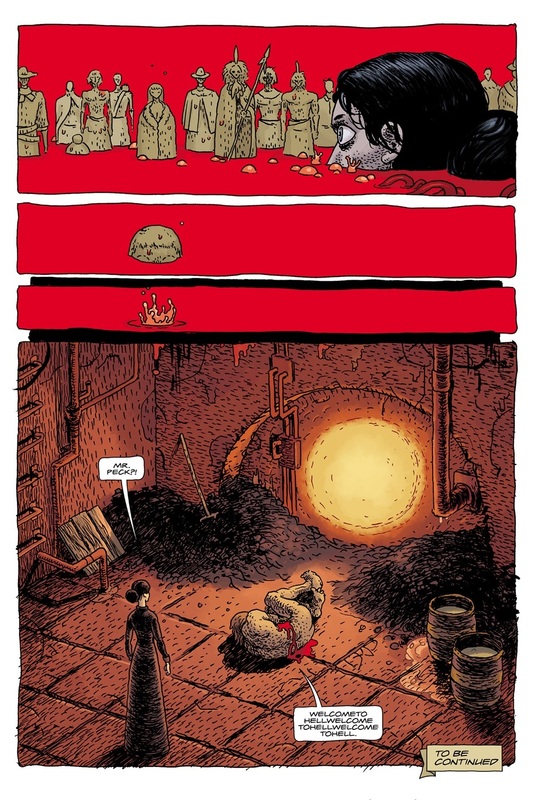 Framed around the life of Ota Murakami, a 20-something soldier who's on the scene when Godzilla first makes himself known to the world, Stokoe's narrative transposes the lifetime of one man against the uncaring, unchangeable force of a god-like beast. Stokoe's application of acidic gradiented colours can take adjustment but his staggeringly stunning, hyper-detailed art is a perfectly-tailored fit to the beauty, savagery and scale at hand. No-one is better suited to deliver the spectacle of huge monsters roaming the Earth: to actually make you feel the terror and wonder of amazing, ferocious creatures doing battle. Cradlegrave by John Smith and Edmund Bagwell: Released from a prison stint for his pyromaniac tendencies, Shane returns home to life on a working class estate to find little has changed. Straining between a sense of loyalty and obligation to his friends and family and the desperate need to leave, his decision is put on hold as he's drawn in to the strange going ons in the home of his elderly neighbours, Ted and Mary. Cradlegrave acutely captures the grim hopelessness of the working class young, trapped in an unceasing cycle of quiet despair, marrying it with a perverse, fetid horror which you'll struggle to shake off. Monster by Naoki Urasawa: Unsurpassed in creating intelligent, emotional, entertaining comics, Naoki Urasawa puts his talents once more to the task in Monster, the story of Dr. Kenzō Tenma, a brilliant young surgeon who saves the life of a young boy in his emergency operating theatre, only to realise years later that he may be the perpetrator of a series of murders taking place. Where Urasawa truly excels is his understanding of people: in writing character and the interplay of human behaviour. No-one is able to introduce minor characters and arcs within a story and make them as nuanced, impactful and as satisfying as he, a facet that the psychologies of Monster provide fertile ground for. Hark! A Vagrant by Kate Beaton: Responsible for propagating a whole sub-culture and the rise of many a meme, Kate Beaton's witty comics featuring literary, historical, and feminist figures; a dollop of artistic license, and expressive cartooning have become so widespread and instantly familiar that they've grown to a life beyond both comics and Beaton. It's easy to see why. The snarky yet affectionate examinations of what is considered Western cultural canon have an accessible appeal, and Beaton has a keen turn of phrase, condensing and dispersing information with effective charm. Boundless by Jillian Tamaki: Although only published earlier in 2017, Boundless is a collection of Tamaki comics published through various outlets over the last few years that gives evidence to the breadth of her capability. That Tamaki is a superb artist with sublime draughtsmanship is well known from her award-winning collaborative works with cousin Mariko Tamaki: Skim, This One Summer. 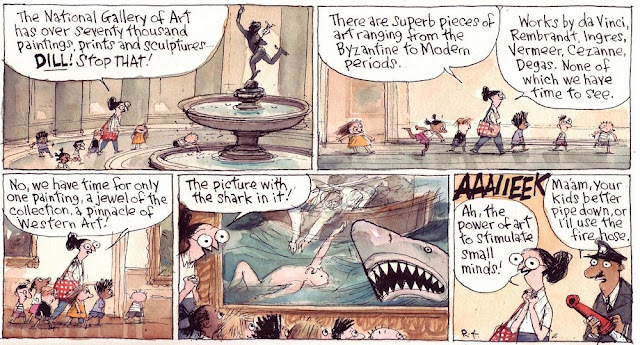 She's also a vitally interesting cartoonist in her own right, chronicling modern life and a generation of 'millenial' adults in an astute, questioning manner that will probably be only fully appreciated when history looks back. 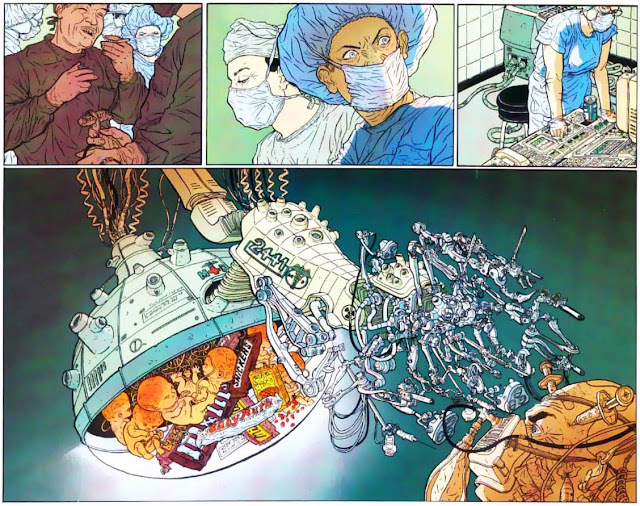 Hardboiled by Geof Darrow and Frank Miller: The machines rise up, or try to, in Frank Miller's and Geof Darrow's violent cybernetic version of the Truman Show. Carl Seltz is a suburban insurance investigator, a loving husband, and devoted father. But he's also Unit Four, a robot killing machine upon whom the hopes of mankind's enslaved mechanical race rest. Which identity will Carl choose? Darrow's glorious heat-filled pages teem with life, as copious amounts of brand names- Snickers, McDonald's, Coca Cola- flash throughout, maintaining a non-strop stream of engorged consumption. A tale of imposed conformity and the consequences of realising you might be more. I started watching the My Hero Academia anime, swayed by the impassioned behest of my friend, Jamila. To cut a long story short (and brevity is one of the aims of this writing exercise), after a slow couple of opening episodes, I was hooked and whistled my way through the rest of the 2 series. I liked it a lot. Enough that the lure of pages from the comic from which it's adapted floating across my virtual path proved too strong to resist. What I want to discuss a little today is an aspect of that comic, namely the manner in which Kohei Horikoshi draws one of his main characters, All-Might, the number 1 superhero in the world. 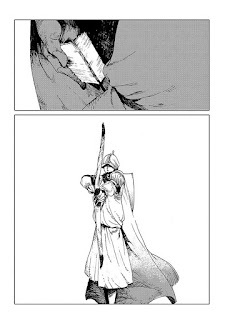 The following observations and analysis are based upon reading books 1 and 2 of the manga. When he's in hero form, All Might is depicted almost as a caricature of a typical superhero. Kohei Horikoshi's lines become thicker, bolder. Increased, heavier texture and hatching are used to render his bulging physique. That exaggeration makes his presence undeniable. He's *there. * There's no missing him. Part of this stylistic choice is in keeping with the inherent humour of My Hero Academia but on a base level, it works simply to distinguish him from everyone else. In a world in which 80% of the population has some sort of special power, and superheroes are a norm, there has to be something immediately distinguishable about the number 1 hero. Bestowing All-Might with a unique, specific drawing style sets him apart from the pack. What does it mean that All-Might is cartoony even in a cartoon? Why choose to portray him as superficially outrageous and ridiculous? What Kohei Horikoshi intends to do is subvert the glamour and cool traditionally associated with superheroes. He's a throwback ('who's this weird, cheerful old dude?' is the feedback Horikoshi says he got from his manga friends). 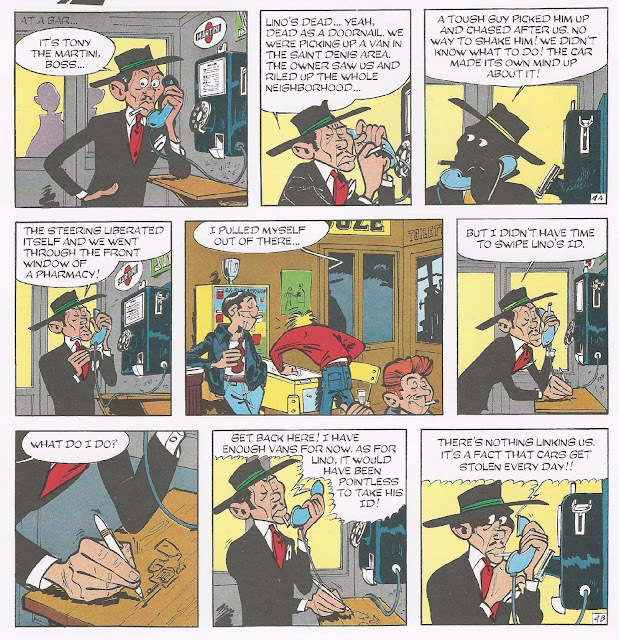 The extreme cartoonishness reminds the reader that they're seeing a deliberate image, that the projected one-dimensionality isn't the only truth. It's a reflection of how All-Might is viewed, and who/what he has to be as a hero. All-Might is as much a construction as he is real, a persona who exists via the ideas and expectations of others. He's shiny, larger than life, indefatigable, with the widest of never-wavering, rictus grins. So much of All Might -as with most public figures- is the meaning people ascribe to him, what they perceive him to be. The symbol of peace. This is something All Might is deeply aware of and what he strives to be: 'The reason I smile is to stave off the overwhelming pressure and fear I feel.' Comfort is derived in him visibly not being one of us: he is more. Drawing him in this overt, pronounced style is a shorthand for conveying those ideas of a silver-age facsimile, an earnest pastiche, whilst underlining his significance. He may be corny, his costume may be outdated; his hair downright strange, but his sincerity and purpose are what make him. The distinction isn't purely physical but extends to his values. Which brings us, finally, to death. Much of the story, and this presentation, seems geared towards All-Might's death. From the very first time we meet him he's hacking up copious amounts of blood, a by-product of a battle-wound that's only getting worse. And I think this is another facet to Horikoshi's depiction: All-Might is a discrepancy within these pages. He is not an object of permanence. What Horishoki is giving us is a journey from man to godliness -note the connotations of the 'all mighty', his power 'one-for-all'(as much an accumulated spiritual network that provides 'strength') - to transcendence. All-Might will pass on, and the more indelible an impression he leaves, the greater the impact of his loss and the absence of that most vibrant, full of pomp figure. It's likely that you're familiar with the legend of the Winchester 'mystery' House in some form: built in 1884 and stretching over 6 acres, 160 rooms and 7 stories, it was constructed under the orders of Sarah Winchester, widow of gun magnate William Wirt Winchester. The story of its baffling, seemingly haphazard design (Sarah served as the sole architect), and alleged unceasing, around-the-clock construction until her death on September 5, 1922, has provided fertile inspiration for novels, films, and games over the years. Its building was rumoured to be instigated by Sarah's visitation with a medium, who revealed a blood curse on the Winchester fortune, resulting in the restless spirits of her husband, young daughter, and all those who'd died at the hands of a Winchester rifle: spirits who needed to be housed and appeased. House of Penance is a further dramatisation of this story, with a focus on Sarah Winchester's grief and motivations. The book joins Sarah in 1905, as she has her husband's and daughter's graves relocated from the family plot in Connecticut to the mansion's grounds. Construction is in full swing, and the practices of the place and its people are slowly revealed to the reader via the introduction of new workforce inductee Warren Peck. There is mad poetry in a house that is ever-built; where the sound of hammers is never allowed to quieten to keep Sarah's ghosts at bay, and these elements are amplified to horrific bent. The 'blood curse' is depicted visually as malevolent, snaking tendrils of red that invade and overwhelm, a metaphorical parallel of Sarah's struggles with trauma and depression. Thus the house and its rules/rituals of constant motion and noise are a coping mechanism: means of keeping the swarm of red from engulfing its inhabitants, whether that means tearing up a newly-completed floor in the dead of night, rearranging staircases that lead nowhere, or smashing mirrors through which the spirits attempt crossover entry. Ian Bertram's art is the reason I picked up this book, and it does the bulk of the heavy lifting in establishing characters, tone, atmosphere, and more. 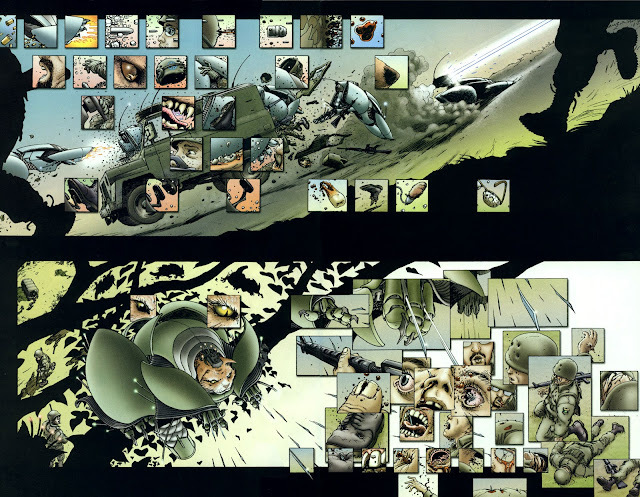 Bertram is often compared to Frank Quitely in style: namely in the way he uses texture (wrinkled dash upon wrinkled dash) and draws figures, but where Quitely's figures are lean and almost spindly, with a creased, leathery quality, Bertram's can go bold through a thicker line or sheer density of texture. Here, that results in a fleshy, almost over-ripe quality- the sense of something waiting to burst out, that feeds the material well, giving new parlance to the ascription of having body. Holding back on the texture has equal effect, cleaner, clearer imagery lending the associated tenor. 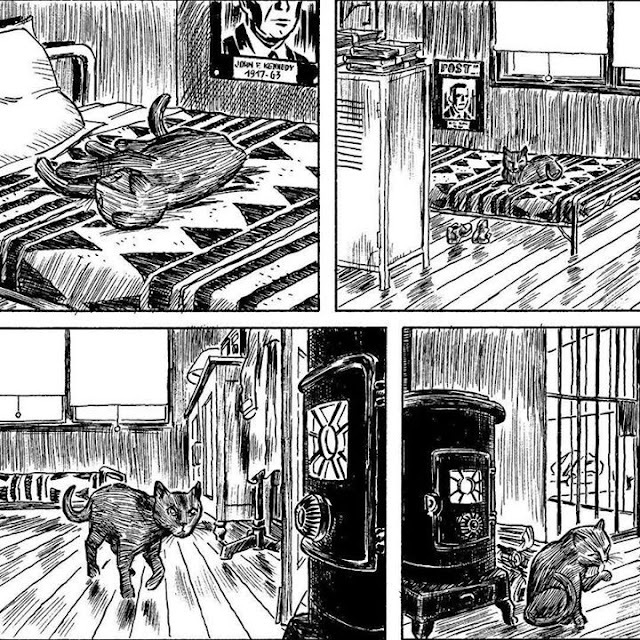 His panelling choices are diverse: thin, elongated wide panel portray the heat and constrictive climate; small, square boxes breakdown and emphasise the time of a dramatic moment, while switching to large, half-page panels of Sarah in the blackness of her bed, highlight her loneliness. Despite the unobtrusive yellow and orange 'BLAM BLAM' sfx, you never get a sense of sound in the same way. 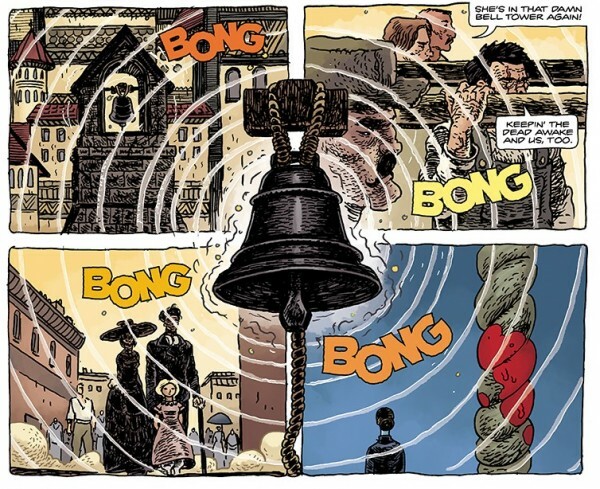 It's a shame, because as this neat ringing bell moment (below) with soundwaves emanating across panels, shows, it could have been well accomplished, and the story certainly provides unique opportunity to do so. Stewart's colour approach, by contrast, is an afterthought: keep all else blandly conservative so the red can take center-stage. I enjoyed House of Penance a lot, not least because it led to me reading about the real Sarah Winchester who lived to the age of 82, and from the only existing photograph of her, looks like she knew exactly what kind of reactions she and her house drew. Yet there's no escaping that the story would benefit from being leaner. And much of that feeling is centred around the inclusion of the Warren Peck character. Peck's purpose in the story is two-fold: to function as the reader's stand in (the person we literally follow from the outside in), and to act as a mirror to Sarah and what she is experiencing, via his own haunted psyche. On both fronts, it's difficult not to view him as unnecessary. Why does the reader require a proxy via whom to understand Sarah? Peck's introduction shifts the focus from her as the central character to instead the person we, along with Peck, are watching. We are watching her trauma, her 'madness' accompanied by a male filter, when she could be presented directly to us with nothing in between. We could -should- be siding with her. The intention may be to reinforce, but instead what comes across is the idea that Sarah's pain and feelings are not valid, her actions not understood, unless shared and experienced by a man. It is Peck who sympathises, Peck who calms her, Peck who 'connects' to her, Peck who offers the possibility of romance, and so it is Peck who 'humanises' her. He even saves her from the dangerous designs of her own house (the house which is a stand-in for her mind, lest we forget). It's not only twaddle -considering this is supposed to be Sarah's story- but bogs down the book, dragging out what is essentially a tight tale for longer. Sarah knows what she is doing, knows how it looks. She is lucid and commanding, and sharply aware of her sister's machinations to get her carted off to the asylum. It is helpful to have a side character for moments of exposition and Sarah's right-hand man Murcer is apt to the role. What Sarah and her house offer, he explains, to the bloody men who work for her, is a particular self-imposed penance: they accept her judgement and recognise her need for salvation in their own; it's a way to confront their guilt and shame 'for embracing all that a gun has to offer'. And while it lasts, it's enough.